The aim of the assignment was to make a performance that will inform and educate people on their local history, whilst using a narrative to recount stories based around The Lawn, which was previously an insane asylum soon to become a new coffee roastery and museum. Stories bring a connection to a site and give people a greater awareness of their surroundings. Children have their imaginations fired up and families share an experience they can relive each time they visit. People enter into the interpretation of a site and tell their own stories – recalling their past or taking flights of fantasy. The whole performance shall be based around audio that will be played through headphones which can allow the audience member to become even more immersed in the performance being given. This concept has been adapted from some other site-specific theatre companies and performances, such as Since I Suppose by one step at a time like this, making the performance much more personal to each individual audience member. Prepared for our ‘drift’ as best we had with our waterproofs, sensible shoes, note books and cameras ready to document the ‘opening up [of] the world’ (Mythogeography, 2015) (See Figure 1) that was promised, we initially were hesitant about how it would go due to four of the group living in Lincoln and all at different ends of the city. However we were more pessimistic that we would be lead somewhere where none of us were familiar with. It wasn’t long though before we were surprised that we had in fact achieved going to ‘places [we] wouldn’t normally visit’ (Mythogeography, 2015). Following the steeper paths in Lincoln, knowing none of us would ever take these paths in our everyday lives, warmed up and breathless we came to a imposing looking statue of a very dignified man, fenced into a small garden (See Figure 2) that seemed to lead to a much larger area of greenery preceding to a very grand looking building with columns at its entrance. Following the fence up the road to find the entrance we were slightly taken aback to see a rundown looking building one side and a large modern hotel on the other with what appeared to be a public car park separating the two. Never the less we continued through and came to a large green with the grand building (See Figure 3) we saw before being at the back of the rundown building we had just past, this was where we wanted to perform. There have been many reported sightings of ghostly figures, including those of children, roaming the corridors and grounds of the Lawn. They are said to wander round looking lost dressed in white robes. There are claims that these apparitions seem to be looking for something that the observers cannot see. Some have even reported hearing loud crying and wailing emanating from within its walls. 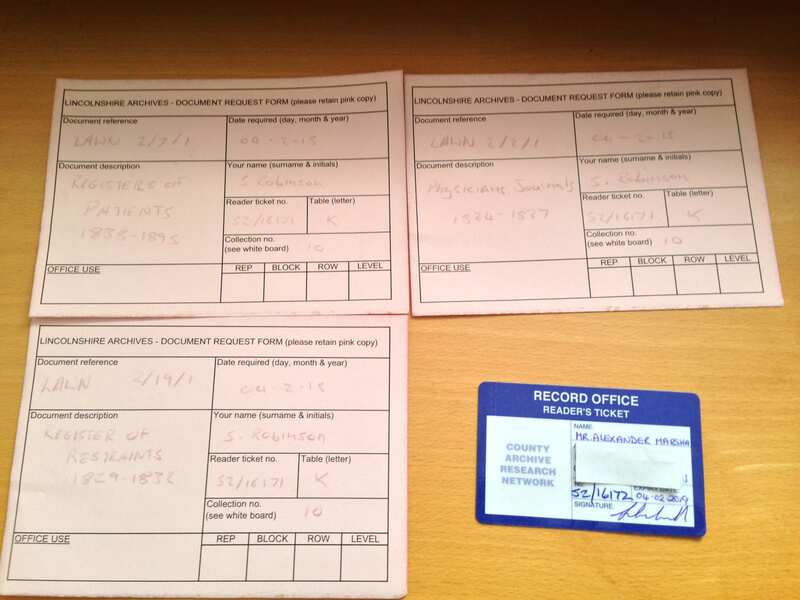 Could these be the sounds of the troubled former inmates? With all the tenderness and indulgences compatible with the steady and effectual government of them and every occupation which my divert the mind, win [at the] tensions and awaken the affections be cheerfully and readily promoted. Entertainment for the patients was an important part of their treatment, and provision was made varying from the purchase of Dominos, a fox and goose board and draughts. […] of penny and a choice weekly magazines […] to music, dancing, cricket, quoits, football, bowls and croquet […] boating, picnics, special dances, theatrical performances, lectures and concerts. Are we ever allowed to lie about a place when we’re trusted by an audience to pass on the information why wouldn’t we be allowed to lie? And if we did enough research into The Lawn as an institution then how much would we be able to fabricate the script of the performance whilst still keeping it true to the events that happened when it was still running? Never the less we decided to stick with what we had read with adding and adjust slight aspects of the stories more to fill in the gaps where areas in the journals could not be read and to make it easier for the audience to follow. As we began the script and established characters we had to work out how we could make it so that their actions were performative. For my character of Dr Edward Parker Charlesworth who led the asylum and who ‘pioneered new ways of treating mental illness, without the use of restraint and barbaric methods to control patients’ (It’s About Lincoln, 2015). We thought it would be a reasonable idea for him to be writing out a letter while the audio is playing. 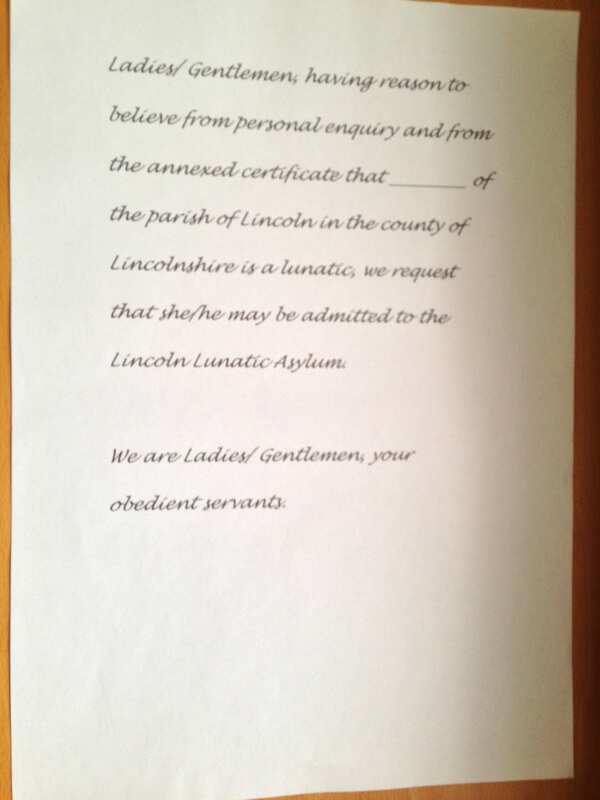 We found the template for a letter at the archive that would be handed to the recently arriving patients confirming them as insane, we also though it would be a nice ‘souvenir’ for the audience to keep after the performance should they wish to. On emailing the council however we found out that the site had recently been successfully sold at auction to ‘RW Stokes and Sons Ltd, the owners of Stokes Coffee and High Bridge Café in Lincoln’ (Lincolnite, 2014). Following this up with getting into contact with Stokes representative telling them of our plans and how we would like to make use of the space for its ‘great history and presence’ (Marshall, 2015), our response unfortunately informed us that although they liked our idea ‘the building and grounds [were] potentially going to be a building site for the next few months.’ (Peel, 2015) Initially seeing this as a major setback, after group discussion we realised this was actually a great opportunity as we could ‘adapt our piece to show The Lawn through the years and what it could potentially be in years to come’ (My City of Lincoln Story, 2015). The idea was also suggested that on their arrival to the coffee shop, the audience member would be given a hot drink of their choosing, be it tea, coffee, hot chocolate, etc. As it would first just appear to be a nice gesture on our part to offer a complimentary drink but by the end of the performance they would realise how it links to asylum and everything else The Lawn was and would become. We chose to move our performance from The Lawn to one of the current locations of Stokes Coffee on Lincoln’s High Street which trying to keep the ‘articulate exchanges between the work of art and the places in which its meanings are defined’ (Kaye, 2000). Due to the positive interest we got when first contacted, the company were more than happy for use to use their establishment. Our site was confirmed as the top floor of Stokes Café on 17th March, we began on reworking the script so that it could be performed in a more confined space and also to show the passing of time from 1824 through to the present day and into the future. One issue we came across while scripting and recording our piece was how we could get across all the information we learned from the archive without just making the piece like a sort of information tour, reaming of fact and fact without any entertainment aspect. 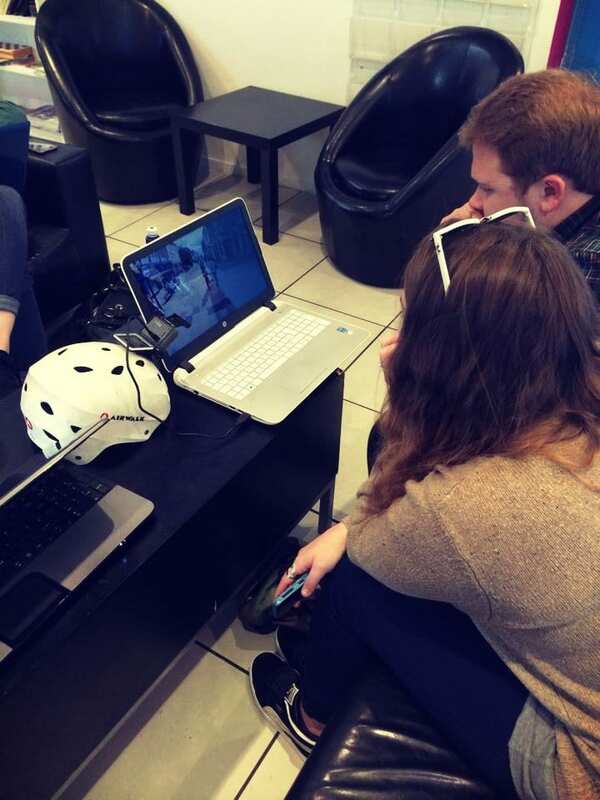 We felt it would be too much just to put it all into the audio tracks we were making and thought that with performing it now in the café where we could stick with the aesthetics of the space and have the information out in a newspaper. Regrettably though after the effort that went into making the first one, it straight away was clear that the mood boards would be too large for the tables we would be sat at in the café and similarly to the news paper, should we have them on a different table to the audience member, there would be no guaranty that they would even be looked at. We also thought about decorating a table cloth in a collage style with various bits of information on but again with the time frame we had we thought this was an unrealistic goal. Finally it was decided to set it out like a menu, in particular Stokes current coffee menu, replacing the headings of ‘Tea’, ‘Coffee’, ‘Snacks’ to ‘Asylum’, ‘Events/Catering Venue’ and ‘Stokes Coffee’(See Figure 7) and instead of names of drinks with prices we had important parts of Lawn history with dates by the side. With everything prepared for the performance in terms of the setting we just had some final details to add onto the sound tracks, all of the script had been recorded, and due to some technical issues and background noise, it had be re-recorded to get it to the standard we wanted. It was still missing the atmosphere we desired though as it was just dialogue with wild tracks behind them, as we had read in the journals at the archive that patients would have been listening to music as a form of entertainment there, we thought it would be suiting that have similar music in the background of a couple of the character’s monologues. We didn’t want anything to well known or popular but through my library of music I was able to find piece which though not necessarily from the period were still in the style of it and also complimented the speeches really well. Having the music behind some of the tracks also helped some of the audio scenes to flow better from one to the other without any abrupt silences. Recordings now already we were finally able to start rehearsing, it was left so close to the performance day that we were all very hesitant of how it would work with everyone’s timings but it had to be left so late due to constant changes with the recordings. On running it we straight away began to hit new issues, primarily with working out our timings, firstly on how long the audience member should be left to sit alone with their drink so they would have enough time to read our information menu and then if they didn’t would it seem to long just to be sat there without anything happening. After a few runs and a few more adjustments to the recordings we were finally ready for our performance. Though our audience numbers were not as large as we would have liked, due to our own lack of publicity, local weather issues, unavailability of the space until a set time and competing against other performances going on in the area, all the feedback received was very positive with very few criticisms. One aspect I found interesting was that each audience member reacting to each character different, something that had not been anticipated as we had never been able to test it with an audience first. [S]pectators are usually conscious of their own status as spectators, and thus as people who may exercise ethical judgement […] we watch ourselves watching people engaging with an ethical problem while knowing that we are also being watched in our watching. The biggest difference was with Ellie’s character of a mother who had lost her child, some audience members felt uncomfortable; some didn’t know whether to reply to the questions they hear her say, some did reply. It was very positive to see the audience get involved with the performance; it just was not what we had anticipated. Every audience member was also very pleased to have a letter confirming their insanity as a small memento of their experience, (See Figure 8)something we were all pleased had worked well with the audience. An aspect I felt work very well was the aesthetic of the building itself complimenting the performance perfectly, due to spending a lot of my time working on the recordings, I hadn’t had chance to ever visit the site since it changed from The Lawn itself. The old Tudor style building work well to complement the time period we had started our piece, though obviously not a Tudor (See Figure 9) period but still old enough that the two would have coincided, it would have been a lot more distracting I feel if we had performed it in a modern café with laminate wood floors and base walls with slogans on. If we had the chance to do it again, my main thoughts on improving it would be its length, in the end the performance was only just over 10 minutes when we could have gone up to 30. The only reason we did not go for a longer amount of time was because whatever we ended up with we wanted it to be a good quality so we spent a lot of time on the recordings making sure there was no white noise and wind sounds. If given the chance and time to do it again, I would like to add to what we already had. The only real altercation I would make to the performances we did, taking on the feedback received would be to shorten the final piece of music on the audio and fade it towards the end rather then it just playing on until we physically came to stop it. One thing I have really come to appreciate through doing this site-specific piece and through the readings I have done is the perimeter of space that one performs in. We set it in an insane asylum, council office space a coffee shop, but nearly the whole performance was done sat in a booth with a single audience member, it was very confined but very effective. This with the suited audio fitting each section helping to great the right atmosphere for each scene, rather than the usual atmosphere you would feel in a high street coffee chain. Bottoms, S. (2011) Materialising the Audience: Tim Crouch’s Sight Specifics in ENGLAND and The Author. Contemporary Theatre Review, 21 (4) 445-463. Etchells, T. in Tushingham, D. (ed.) (1996) Live 4: Freedom Machine. London: Nick Hern Books. Haunted History of Lincolnshire (2015) The Lawn. [online] Lincoln: University of Lincoln Blogs. Available from: https://hauntedhistoryoflincolnshire.blogs.lincoln.ac.uk/lincoln/the-lawn/ [Accessed 28 May 2015]. Its About Lincoln (2015) Lincoln Lunatic Asylum. [online] Lincoln: Angelic Aromas. Available from: http://www.itsaboutlincoln.co.uk/lincoln-lunatic-asylum.html [Accessed 28 May 2015]. Gillett, J. (2008) Site Specific Stories. [online] Chester: The Journey Man. Available from: http://www.thejourneyman.org.uk/site-specific-stories.html [Accessed 28 May 2015]. Kaye, N. (2000) Site-Specific Art: Performance, Place and Documentation. London and New York: Routledge. Fish, E (2014) RW Stokes win bid to revamp The Lawn in Lincoln. [online] Lincoln: The Lincolnite. Available from: http://thelincolnite.co.uk/2014/11/stokes-coffee-win-lincoln-lawn-bid/ [Accessed 28 May 2015]. Lincolnshire Echo. (2014) ‘Embarrassing’ Lincoln landmark The Lawn to go back on sale. [online] Lincoln: Lincolnshire Echo. Available from: http://www.lincolnshireecho.co.uk/Embarrassing-Lincoln-landmark-Lawn-sale/story-20767634-detail/story.html [Accessed 28 May 2015]. Marshall, A. (2015) Performance at the Lawn. [email] Sent to Nick Peel, 17 February. My City of Lincoln Story (2015) Archieve – Samuel Robinson. [blog entry] 10 February. Lincoln: Lincs to the Past. Available from http://sitespecific2015ksa.blogs.lincoln.ac.uk/2015/02/10/achieve-samuel-robinson/ [Accessed 28 May 2015]. My City of Lincoln Story (2015) The Lawn its Problems!. [blog entry[ 19 February. Lincoln: Lincs to the Past. Available from http://sitespecific2015ksa.blogs.lincoln.ac.uk/2015/02/19/the-lawn-its-problems/ [Accessed 29 May 2015]. My City of Lincoln Story (2015) Lincolnshire Archive by Anya Fitzgerald. [blog entry] 4 February. Lincoln: Lincs to the Past. Available from http://sitespecific2015ksa.blogs.lincoln.ac.uk/ [Accessed 28 May 2015]. My City of Lincoln Story (2015) The Lawn – Lincoln Archive – Alex Marshall. [blog entry] 6 February. Lincoln: Lincs to the Past. Available from http://sitespecific2015ksa.blogs.lincoln.ac.uk/2015/02/06/the-lawn-lincoln-archive-alex-marshall/ [Accessed 28 May 2015]. Mythogeography (2015) Starter Kit. [online] Publication unknown. Available from: http://www.mythogeography.com/starter-kit.html [Accessed 28 May 2015]. Pavis, P. (1998) Dictionary of the Theatre: Terms, Concepts and Analysis. Toronto: University of Toronto Press. Peel, N. (2015) Performance at the Lawn. [email] Sent to Alexander Marshall, 18 February. Ridout, N. (2009) Theatre & Ethics. Basingstoke: Palgrave Macmillan. The Madness behind Coffee performance situated at Stokes High Bridge Café in Lincoln. Each performance lasted about 15 minutes. In the café we had the space booked from 3pm to 5.30pm. To advertise the performance we made a poster which we posted on the university website. From the poster we had a few people interested, they contacted us and we arranged booking slots for them to come and participate in the piece. We had four audience members come to see the show, we gave them each 30 minute slots as we wanted them to have a drink and not to feel rushed. We also gave time for them to sit and finish their drink if they wanted too. 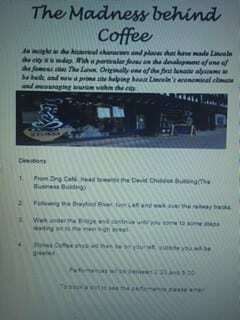 In the final performance my role was communicating with the manager of the coffee shop, setting up for the performance and performing in the piece. Marie Szalwinska stated that “These days, audiences expect more from site-specific theatre: the execution has to be as strong as the idea”. (Szalwinska, 2007) Due to our belief in Szalwinska’s ideals, we placed heavy emphasis on the need for rehearsals, ensuring our end performance clearly delivered on what we believe is a strong idea. We started our performance by greeting the audience member and ordering them a drink of their choice, once they had their drink they were led upstairs and sat at a table. They were then given the headphones and advised to start the experience by beginning the playback. First to enter was the doctor. The doctor showed the side of The Lawn which he wanted people to see, he wanted the audience to know that The Lawn was a great place. “His methods were revolutionary – and unpopular – in his work to change the restraint methods employed by medical staff in the majority of mental hospitals”. (AA Ltd, 2015) The nurse then entered, she showed how The Lawn was for her to work in, followed by a patient who gave her experience of her time in the asylum. The audio then moved on to the council and how they were selling The Lawn and finally on to the future which a Stokes representative showed the future of The Lawn and what it will become. Our main influences for our performance came from the drift and going to the Lincoln Archive. We initiated the process by beginning a drift together in our pre-selected groups. A drift was a new experience for the rest of the group and I “You can drift anywhere. But to begin with, start somewhere you know well”. (Smith, 2015) We started at a common place, the LPAC building on Lincoln University campus. At every point a decision on direction was required, whether it be at a fork in the path or a junction in the road, one of the group would simply select where the group would go purely on impulse. “You don’t have to get anywhere, there is not a set destination. It’s all about the journey”. (Smith, 2015) The group really took this on board, enjoying the freedom such an unexperienced approach gave us. Continuing to let the drift take us anywhere in & around Lincoln, with no pre-selected destination or path all of us found new places in the city that we had not previously explored. As we walked around Lincoln we found a statue of Doctor Edward Parker Charlesworth. On the statue was an explanation of who Dr Charlesworth was, why he has a statue and the work he did at a place called The Lawn. We carried on drifting, following the road and that’s when we came across a building. We decided to explore further and enter the grounds. As we entered we came across a sign which had further information about The Lawn, it explained that it used to be a mental asylum and gave us the initial dates we needed. After reading the sign we carried on walking around the grounds. It had an eerie feel, especially as the building was locked up and empty. 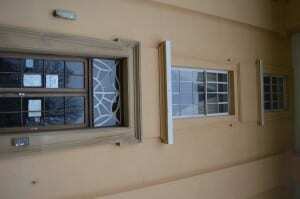 We looked in some windows and it was clearly evident that it used to be a hospital. 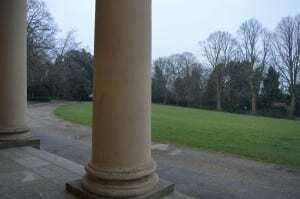 The grounds were surrounded by trees and there was lots of empty space which the public were using to walk dogs. In the corner was a children’s playground, exploring further it looked very old and seemed to be unused. Although the building’s interior was dated and gave us a sense of unease, the surrounding grounds were beautiful and gave us all instant ideas of what we could do. “By walking, you escape from the very idea of identity, the temptation to be someone, to have a name and a history … The freedom in walking lies in not being anyone; for the walking body has no history, it is just an eddy in the stream of immemorial life”. (Gros, 2014) The drift provided exactly the aforementioned escapism for our group. When we began our journey we had no preconceptions, destinations or ideas. Upon our return we had found a site that we wanted to build our piece around, and ideas that grabbed the imagination of us all. It was exciting and something different for each of us. Our first idea was to do a ghost walk of The Lawn and use researched stories of previous asylum patients, our intention being to deliver both an informative as well as an interesting piece. “There have been many reported sightings of ghostly figures, including those of children, roaming the corridors and grounds of The Lawn. They are said to wander round looking lost dressed in white robes”. (Phu, 2015) We began conducting online research, endeavouring to find more information about past patients. We prioritised the accuracy of our content. We quickly ascertained that, due to the lack of online information, we would need to find alternative sources. This led us to the Lincoln archive. “The experience was new to us and we found the process of the research exciting yet daunting as there were strict rules held in place whilst you were inside the Archive center due to the building holding factual and statistic information about the people of Lincoln and Lincoln itself”. (O’Sulivan, 2015) The archive helped us gain insight into The Lawn and how it worked in the 1800’s, which for the ghost walk helped us a great deal. As we wanted to make the ghost walk as authentic as possible, finding out how the doctors treated the patients and what the patients did on a daily basis created the story line of our ghost walk. “Johnny Gillett thoroughly researches the history of the site or the subject matter to be explored. This includes visits to libraries, records offices and even local people, as well as viewing the site itself several times. His hope is to gain a deeper understanding of the venue, tie this together with his own storytelling knowledge and so create a unique programme of tales to re-interprete the site”. (Gillett) In order to execute on authenticity, both extensive research and frequent location visits were undertaken by the group. The archive was informative and told us much about The Lawn. Personally I found it very interesting looking at why some patients were admitted. Some stories that we found highlighted that misdiagnosis was rife in the 1800’s, often leading to admission for what I perceive to sometimes be simple cases of grief. The information gained from the archives meant we could now start the first draft of our script. We decided a script was the most effective way to do the recordings. When writing the script we started to plan the initial route for our performance. Starting at the tourist centre at the top of the hill and making our way round to the statue and The Lawn and going around grounds. Throughout the grounds we would be positioned, acting out the stories of the patients we had researched. As the idea developed we needed to find an ending. This meant more research to stimulate ideas. We needed to find out about the reasoning behind The Lawn’s closure. We discovered The Lawn is being developed in to a coffee roastery. The more information we found out, led us to develop our second idea. This was to tell the tale of The Lawn, what it used to be, what it is now and what it could be in the future. Using the same concept as before and travelling around The Lawn premises we would help us achieve this. We were happy with our new idea but staying true to our ideal of factual accuracy, we needed to return to the information we gathered from the archive. Having finalised the script we were ready to record however, we came across our first problem. The Lawn would be partly closed off due to refurbishment which meant we would not be able to use all our desired areas. This meant taking the piece in a different direction. We had a group meeting and discussed other possibilities. These were using part of The Lawn but we decided that the builders may be too loud for the audio. Next we thought about doing the piece at the statue but that again had it difficulties as it was such a small space to perform. Anya then suggested performing the piece in stokes coffee shop. “Practitioner Peter Brook famously announced that ‘I can take any empty space and call it a bare stage’ (Brook 1972:11). Brook was interested in work that might take place beyond the conventions of the proscenium arch theatre and looked to experiment with different performance sites”. (Govan). Govan influenced me to work with Anya’s idea as adapting the script and performing in a coffee shop excited me. Once we decided this was the best option we worked hard to catch up on the time we had lost. When re-visiting our research, we found a previously unused letter and when re reading it, discovered it gave invaluable insight into what a patient’s life in the asylum was like. We all believed the letter would help the audience member to better engage with the feeling of The Lawn. We then decided that my character the nurse should give the letter as the nurses had to deal with patients. “In addition to Anya’s information from her previous post we also found questions within the register which were asked to relatives/friends of the admitted patient. These questions excited us as we believe we can use them on our audience so they have a real sense of what it was like to be a part of the asylum”. (O’Sulivan, 2015) My character the nurse had to deliver both these bits of information in my audio monologue. After finalising the script we started recording. Using the recording device I found this to be fairly easy. We did some testing to see where it was best to record for a clear sound. We found that to get the sound we wanted we needed to find a space with no noise or echo, for this we used corridors in the Lpac. We would leave 10 seconds either side of the recording to be able to play with the record on audacity and we also did at least two recordings. Once we did the recording we put them on to audacity and started to edit and arrange them in to an order. To make the audio sound natural, we needed to have background noises. As well as recording we had props to prepare. Firstly we started with a newspaper. We did not want to risk audience engagement through an overload of facts, dates and/or information through the audio. We therefore came up with the idea of a newspaper prop, this would help deliver the aforementioned information through a different medium, adding diversity of content delivery. However, when reviewing the newspaper with Karen, it was decided, as a prop, it was not fit for purpose as there was too much content. We subsequently shifted to the idea of a mood board. This would have key facts and dates but also provide visual stimulation for the audience member in the form of pictures. We sourced cork boards, making them into the mood boards. They looked effective, but we felt that they did not fit in to the piece as they were large and would not make sense in the context of the scene. Finally we decided on a table style menu, this had key dates, actors, facts and a little information about The Lawn. 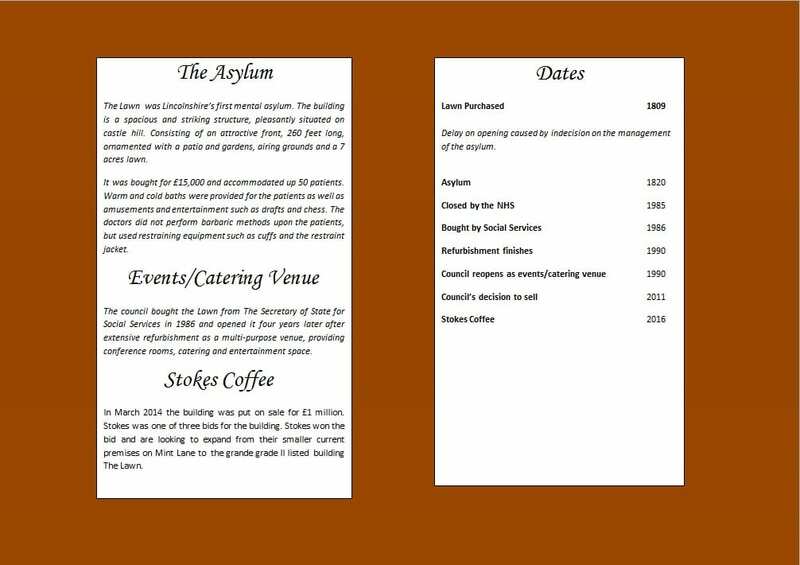 We did the menu in the style of the Stokes café so it would fit in with the décor. The menu worked well as it was brief, but concise, delivering the exact content desired. On the day of the performance we met early in the morning to go over last minute issues and do a full practice run. We started by preparing a timeline for the day, intending this to drive productivity. We then printed off our paper props. These were a menu in the style of stokes, a letter which we had found at the archive and a poster for the audience member as it had directions to the site. Once we did this we split the group in half, Alex and Sam went to finalise the audio and give the poster to the audience members. Anya, Ellie and I went to get a few last minute props, these were a note pad, pen and envelopes. Once we had all returned we got changed into our costumes to perform a dress run. We had to use Sam to listen to the audio while we performed and then I swapped with Sam just before his part. This was hard to know if the piece flowed as we had to swap throughout people’s monologues. Once we were happy we decided to make our way over to the coffee shop and start to set up. (Robinson, 2015) Fig 6,7. (Bullock, 2015) Fig 3. Our set was minimal as we used the features of the shop. We set up our audio device, where we were going to be based during the performance and any props that we needed to use during the piece. Once we were set up we waited for our first audience member. Four audience members were booked and each had a half an hour slot, this gave enough time for a hot drink, and preparation with the audio device we then also left enough time for them to sit and finish their coffee. There was the option to take it away also. Each performance went differently. The first one for me went well but I was nervous and I made silly mistakes. Going in to the next performance I felt more comfortable and really got in to the performance actions. Each performance provided more confidence and, I believe, a subsequent improvement. During the last performance, the audience dropped cake on the floor and laughed which I found hard not to laugh as well. The final performance I felt went really well, although there were difficulties and things which did not go entirely as we had practiced. However, with improvisation we managed to create and perform a great piece. It was a different experience performing in a coffee shop, as it was not a typical location. 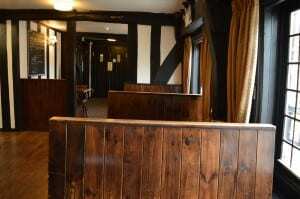 It worked well for us as we wanted to give a coffee shop experience which we feel was delivered. Performing in a coffee shop was a non-traditional place to perform, I liked this and after performing in a different location I am intrigued to work more on pieces like this. The alternative location gave the performance a different feel for each audience member, dependant on how they engaged with the script, scene, props and performers. I am very keen to develop further on The Madness behind Coffee. Throughout the process I thought we worked well as a group, this was continually a strength and the results would not have been the same without this synergy. The members of the group complimented each other as Alex and Sam knew quite a lot about using audacity so they naturally did a lot more of the editing. The creativity we all brought was a strength as we all had so many ideas that we wanted to do which gave us and ended in the performance we gave. The communication within the group was good which it needed to be. Sometimes throughout the process certain members could be difficult to work with. As we had so many ideas they could be conflicting and not work, we did however try to work through every idea people had to try and see if we could incorporate them within the performance. Another difficulty we had was when we finished our timetabled lessons we all had difficult availabilities so there would be weeks where the whole group could not meet up which meant we did not always get as much work done as we would like. Another weakness we had was timing, we had no clear way to time our monologues. As we could not hear the audio it was hard to gage where were within the script. Alex had a watch which he incorporated into his costume and made work for him. Anya performed her part outside so she had her phone timer. Sam used his tablet which he made part of his performance however for me and Ellie there was no simple way to have a timer as I was from the past and Ellie was a patient and she would not have been allowed any jewellery. There was a few things I would improve from the final performance which was to find a better system of timing the monologue so is not as obvious and we don’t have to count in our heads. I would want to work on the interaction with the audience as some member actually spoke and answered questions asked on the audio which I found interesting and I did not expect to happen. I thought this really worked and felt the piece could have had more of this if the audience member wanted to. With more interaction I felt we could have done more with our performances, for example I could have done more nurse actions. From the performance I had new ideas form during the performance and after. Some ideas that I had were to extend the script and the make the performance longer, partially focusing on The Lawn as I think that could be extended and more. I also think that the characters should not just have one monologue and go they should come in out during the performance. The only problem I see with this is the timing. Bullock, L; Fitzgerald, A; Marshall, A; O’Sullivan, E; Robinson, S. (2015) The Madness Behind Coffee. 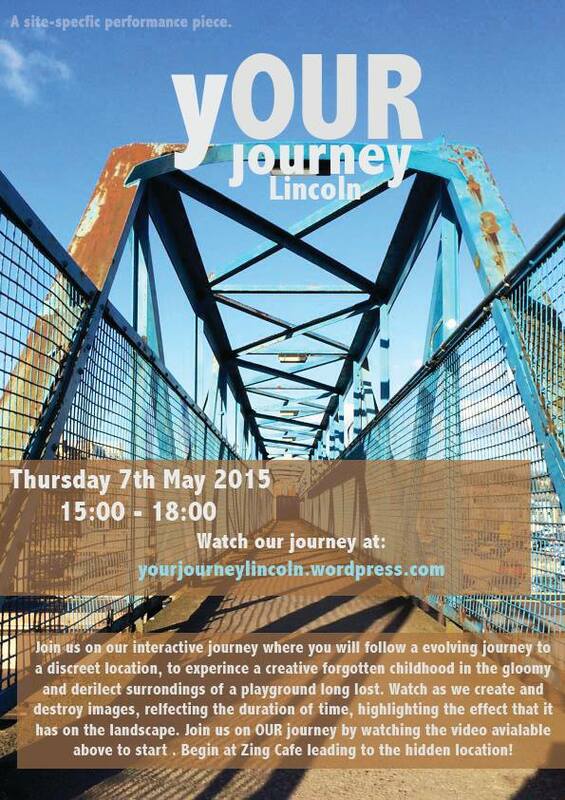 [Performance] Lincoln: Stokes Coffee Shop, 7 May. Govan, M. The Place of the Artist. Gros, F. (2014) A Philosophy of Walking. London: Verso. Smith, P. (2015) A Starter Kit for Drifters. Szalwinska, M. (2007) Site Specific work is just about location, location, location. The Guardian, 26 April. Looking at what has occurred and what is yet to come of The Lawn Lincoln Mental Asylum stands the main element of our performance ‘The Madness Behind Coffee’. 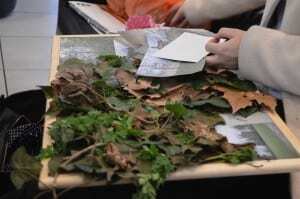 Taking the audience one-to-one on a journey through time presenting them with factual information about The Lawn through the use of character and voice gives the viewer a real insight into how The Lawn was and what it will become. The use of speech and audio is the key performative component within our performance. The complete script of our piece is to be listened to through a set of headphones, where characters stories and factual information about The Lawn will be received. The performance is set in Stokes Coffee shop due to The Lawn being under reconstruction works in order to turn it into Lincoln’s new Stokes cafe. Throughout the performance the audience receives a real essence of time travel through interaction, not only by voice but by key gestures provoked by the characters whilst listening to the factual audio. The use of music through the audio piece also sets the scene of the performance adding authenticity. Due to the music being relevant to its time it creates the effect of time travel. Each one-to-one performance is 15 minutes long, capturing the main elements of The Lawns 200 years of history. Focusing on The Lawn specifically we found in order to keep its culture and history within our performance that the only other option would be to set our piece in a location where the audience would feel the future essence of the building, which is Stokes coffee. Fiona Wilkie and her ideas we found influenced our site location. A specific quote from Mapping the Terrain we found specifically useful; ‘Search for alternative venues in which to stage performance is a means of encountering and creating other maps of the cultural space’ (Barker and Trussler, 2002). Enrapturing the same culture in a new space other than The Lawn we found was crucial for our performance to be a success, we found Fiona’s journal useful in guiding us to selecting the right sight in order for it to still be site exclusive. Our audience within the performance may interact as much or as little as they would like. Due to our piece only having speech through audio the audience may feel reluctant to participate. However, physical actions which the characters display such as playing chess, may provoke the audience to participate. ‘A more active participation in both site and performance provides the opportunity to actually embody site’ (Birch, Tompkins 2012). ‘Since I Suppose’ is a site-specific theatrical experience based on Shakespeare’s classic Measure for Measure by American Theatre Wing Company. The show allows the audience one-by-one to travel on an impressive journey through down town Chicago. The production uses audio and video to guide the audience through the city. Our original idea was to create a ghost walk of The Lawn Lincoln using the audio device, we found this specific performance rather influential as it helped guide us to create a piece based around audio and the city of Lincoln itself in which the audience is the centre of the performance. Within the YouTube video of Since I suppose the director quotes ‘I describe what we do as immersive theatre, the audience is in the centre, the show happens upon them, they experience it first-hand’ (American Theatre Wing, 2014). I found American Theatre Wing to help influence and develop our mythogeography process. There are many benefits to Site Specific performance, many of which are towards the community. Often there are communities which are unable to access the theatre due to financial issues and there is also the concern of feeling out of place. Site specific performance brings the theatre to the community performing in specific areas and locations making theatre more affordable and approachable. We started our process by Looking at Mythogeography; ‘a way of walking, thinking and visiting a place on many levels at the same time’ (Smith, 2010) and from this our group were asked to perform a ‘drift’. Minimal instructions were given from an online source ‘A Starter Kit for Drifters’, as ‘You don’t have to get anywhere, there isn’t a set destination, and it’s all about the journey’ (Smith, 2010). We decided to start our drift from the LPAC a place we were all familiar with and decided to head towards uphill Lincoln as we were all less familiar geographically with this specific part of the city. Every time we emerged at a junction, we decided spontaneously which way to turn. We were asked to free ourselves from our normal walking habits, this we ensured as we came across buildings and sites which were visually new to us in Lincoln. We came across buildings such as the Water Tower, which we later found was built due to a deadly outbreak of typhoid between 1804 and 1805, a valuable and historic building in the city of Lincoln. During our drift the building which captured our eyes and imaginations the most was The Lawn. 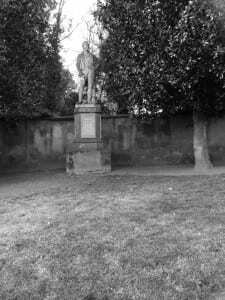 First, we came across an iron statue of a man which was labelled as Edward Parker Charlesworth an English physician, known as an innovator in psychiatric treatment. The Grade II listed building stays true to its history with the exterior and grounds remaining as authentic as possible. We were suddenly surprised when we were to read the sign placed at the front of The Lawn explaining that The Lawn was built for the purpose to treat the mentally ill. 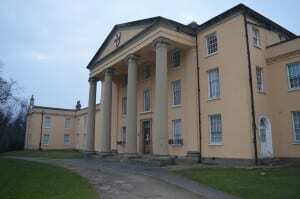 The building opened in 1820 as a mental institution, and was the first Mental Institution to not use barbaric treatments. From here we were adamant that this was the site in which we would like to research further and we were very keen to process our ideas and develop them. Within our development process, we decided to search for more detailed history about The Lawns Mental Patients. 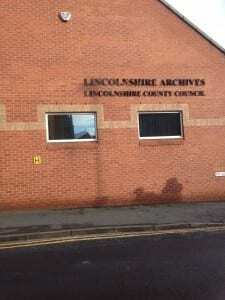 We then came across a site which informed us that the Lincoln Archive centre held ‘Records of the Lawn Hospital, Lincoln, formerly the Lincoln Lunatic Asylum’ (Lincs to the past, 2012). The experience was new to us and we found the process of the research exciting yet daunting as there were strict rules held in place whilst you were inside the Archive centre due to the building holding factual and statistical information about the people of Lincoln and Lincoln itself. I went on to view the Restraint register book, which I found captivating due to its fragile condition holding the original documents. Within the register held a letter which asked formative questions to relatives/friends of the admitted patient, such as; ‘At what period of life did the patient first exhibit symptoms of insanity?’ and’ Has been under any medical care whilst insane, if so who’s’, This specific letter we used within our performance and handed it to the audience member in order to create a personal connection and to allow the sense of time travel. Within the register of restraints used within the Asylum we found that the hospital used several restraining methods on their patient’s almost every day for decades, such as hand cuffs and the restraint jacket. We were enthusiastic to see how we would be able to incorporate the factual information about the restraining methods into our performance. Former group members Samuel Robinson and Alexander Marshall searched a document revealing the patient’s doctor records. Here is where we found several reports based on single mothers demonstrating the psychotic effects which the withdrawal from their child had on them. We decided to go forward with this information, in which we created a character for our performance based on our findings. Due to the minimal information found within the doctor’s notes, we decided to take on a more fictional approach. However, in order to create a piece which is true to its events how much can we fabricate the stories? Researching into this we found a chapter named The Place of the Artist by Tim Etchells who quotes ‘ How long do you have to have lived somewhere until you’re allowed to lie about it’ (Etchells,1996, 51). 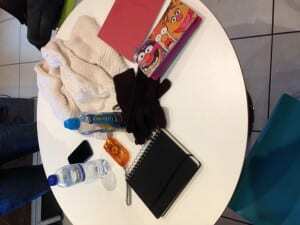 From this we decided to not lie about the stories but to create a sincere character in which the audience will be able to interact with and play chess whilst also hearing the characters thoughts about her withdrawn child and the upset in which it will have caused through the audio piece (headphones). ‘Entertainment for the patients was an important part of their treatment, and provision was made varying from the purchase of Dominoes, a fox and goose board and draughts’ (My City of Lincoln Story, 2015). We decided to use the action of playing chess within our piece to create an emotive connection between audience and performer. We found the facts about the entertainment and the patient’s story’s rather emotive and from this we started to develop characters such as the doctor, the nurse and the patient. We assumed that the audience would find it more shocking that the hospital didn’t use such harsh restraints, however, would sympathise with specific characters we chose as well as finding the president of the building to be an inspiration. Taking our findings forward we drifted from the idea of a ghost walk and decided the performance would have more of an effect if we presented the audience with valuable information about The Lawn whilst generating a guided factual tour based performance around The Lawns grounds. Ideas were taken from the works of ‘The Journey Man’ who produces site specific works for families and children to ‘give people a greater awareness of their surroundings’ (Gillet, 2015). Johnny Gillet researches thoroughly into the history of a specific site by visiting ‘libraries, record offices and even local people as well as viewing the site several times itself’ (Gillet, 2015). His detailed research process gave our group ideas into how far we can actually take our research and offered us accommodating research methods which we engaged with. In order to receive rights to perform at The Lawn, we decided to email the council to make sure our ideas were suitable. Much to our surprise we discovered the news that the Lawn in fact had been sold to Stokes Coffee and was going to be under construction and refurbishment work, so we were unable to use the grounds. From here despite the obstacle we decided that performing in the former Stokes Coffee Shop on Lincoln’s High Street would be a great substitute. Not only would this performance space be site specific to the history of The Lawn, but it would also open up the audiences minds to how The Lawn will be in the future. We were able to hire the top floor of Stokes Coffee in the heart of Lincoln itself overlooking the High Street a truly remarkable setting. Our ideas started to expand and we decided to take the audience on a journey through time, captivating them with the history of The Lawn, still using the facts we gathered and the stories creating an audio based piece for the audience members to listen to, whilst indulging in a Stokes hot beverage, and viewing the actions of The Lawn’s characters from across the table. To elaborate our ideas and to make the performance more personal towards Stokes coffee, we decided to add audio and performance material suggesting the closure of The Lawn, explaining how it was re-opened by the council for hospitality and catering use. 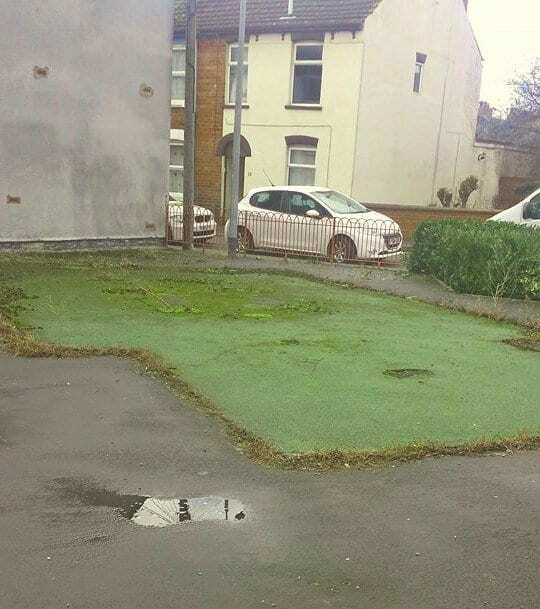 And how the council then went on to sell The Lawn, ‘The City of Lincoln Council has been trying to sell The Lawn, which is currently vacant, for three years’ (BBC, 2014). Here in the performance we had an outside interview take place in which the audience may view from the window in the coffee shop. The interview stated facts about previous bidders as well as explaining that the council were desperate to sell The Lawn as it was an embarrassment ‘Frankly, at the moment it is an embarrassment (Lincolnshire Echo 2014). Here the audience consider how The Lawn used to be a remarkable feature of Lincoln as it was the first mental institution to not use barbaric methods, to how eager the council were to sell the building as they feel it had lost its history and purpose. Within the interview we decided to introduce the next character, a Stokes representative who successfully won the bid and purchased the lawn for 1 Million pounds in order to create a roastery café. ‘Three bidders were selected after the initial selection process, and then presented their proposals; Stokes was chosen by the City Council in a private session of the Executive Committee on Monday night’ (Fish, 2014). Group Member Samuel Robinson entered the café during our performance, playing the part of Stokes Representative Nick Peel, introducing himself to cast members and audience members by shaking their hands and welcoming them to the future Stokes Coffee shop by presenting pictures of Stokes ideas for The Lawn on his iPad. The use of the iPad demonstrates the change in time from the writing of the letter to the use of electrical equipment, illustrating that The Lawn has been a part of Lincoln’s history for two century’s. To start the performance, when entering the coffee shop we decided to provide the Audience with a Menu in which we created. 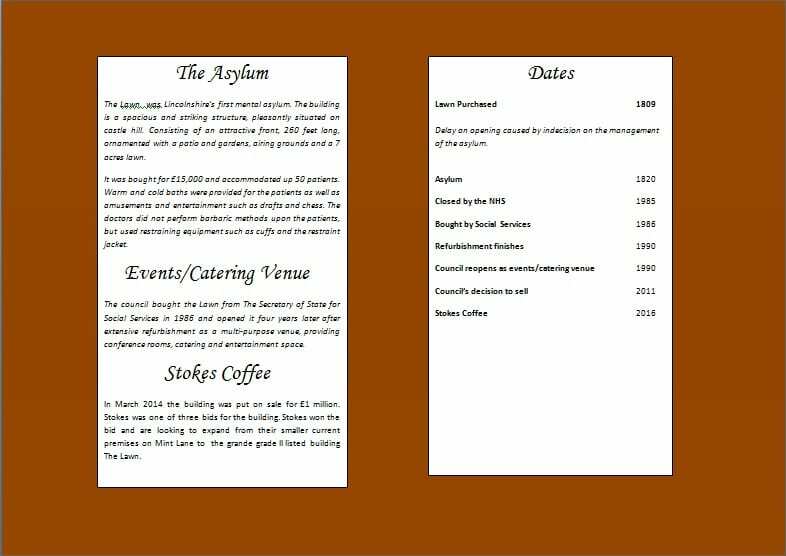 Almost identical in appearance to that of Stokes Coffee menu, however, we edited it with key information about The Lawn and key dates which the audience can take into account throughout the performance. Images of the Lawn, our overall idea and a cast member list was also provided within the menu. Our final performance consisted of four one to one performances, between 3.30pm and 5.00pm lasting around 15 minutes. Set in Stokes café on the Lincoln High street the audience members seemed to settle well in their surroundings, relaxing whilst reading our created menu and enjoying a hot drink. When the audio equipment was introduced and the performance was underway, I found myself surprised at the audience’s interactions within the performance. During my specific monologue as the patient, whilst setting up the chess bored I encountered an audience member asking my name. In response to this I stayed true to character and distanced myself from the audience member with a slight look of disapproval. I personally feel the audience found the production to be personal as we designated the written patient’s letter to the audience member personally by addressing it to them with their personal names. Timing within the performance was crucial and we illustrated our confidence with the specific timings successfully, entering, exciting and performing key movements at the right time with the audio. This I felt showed professionalism as it allowed the performance to run efficiently. New ideas sparked as the performance came to an end, we felt we could take the performance further by elongating the experience, allowing the audience to communicate with the characters further. Also I feel expanding on the stories of the Lawn and focusing on the history rather than the future of The Lawn may have been more alluring for the audience. We as a group could possibly expand the performance even further by showing the audience members the actual grounds of The Lawn so they can relate to the feel of the performance even further. Within the performance I feel Stokes itself may have been advertised a little too much. Drinking from Stokes cups, reading from a Stokes menu within a Stokes café may have been a little too much. If I were to perform the piece again I would maybe detract slightly from the advertising of Stokes itself and focus more on the key feature of our performance which is The Lawn. Engaging with site specific theories I found very beneficial within our development process. The idea of mythogeography and the process of drifting I find advisable, as it allowed us to reach places and sites we hadn’t seen before. The search into key practitioners such as Blast Theory I found didn’t necessarily link with our piece as they were more art and physical theatre related. However after researching into more depth about site specific practitioners we found artists such as The Journey Man to be very relatable due to its story telling about specific places and venues, educating audience members with history and factual information about a specific site. Birch, A and Tompkins, J. (2012) Performing Site-Specific Theatre: Politics, Place Practice. Basingstoke: Palgrave Macmillan. American Theatre Wing (2014) Working in the Theatre: Since I Suppose – Site Specific Theatre [online video] Available from https://www.youtube.com/watch?v=WBN1a352cPY [Accessed 13 February 2015]. Barker, C. and Trussler, S. (2012) New Theatre Quarterly 70. Cambridge University Press, 18 (2) 140-160. BBC, (2014) The Lawn to become Stokes coffee ‘micro roastery’ [online] Lincolnshire: BBC. 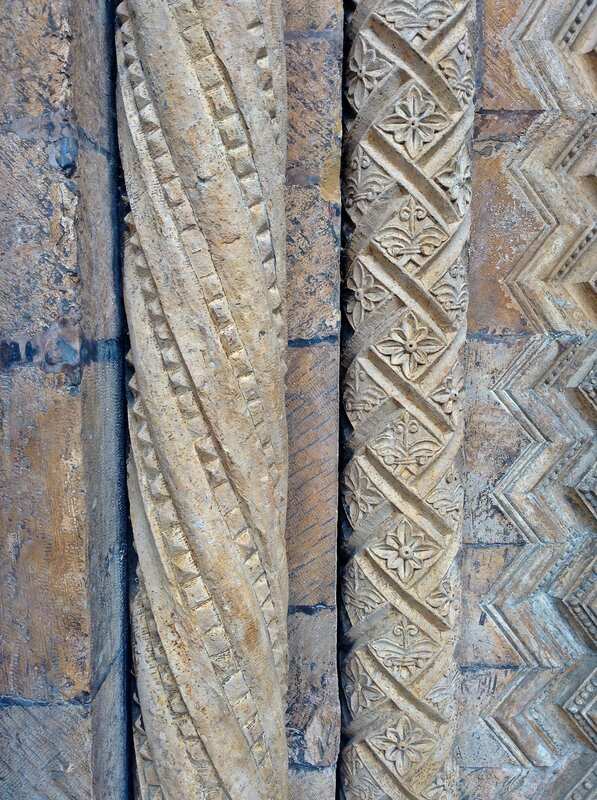 Available from http://www.bbc.co.uk/news/uk-england-lincolnshire-30267928 [Accessed 15 February 2015]. Fish, E. (2014) RW Stokes win bid to revamp The Lawn in Lincoln. [online] Lincolnshire: The Lincolnite. Available from: http://thelincolnite.co.uk/2014/11/stokes-coffee-win-lincoln-lawn-bid/ [Accessed 15 February 2015]. Kaye, D and Lebrecht, J. (2009) Sound and Music for the Theatre. The Art and Technique of Design. Oxford: Elsevier Ink. Lincolnshire Echo (2014) ‘Embarrassing’ Lincoln landmark The Lawn to go back on sale. [Online] Lincolnshire: Lincolnshire Echo. [Available from] http://www.lincolnshireecho.co.uk/Embarrassing-Lincoln-landmark-Lawn-sale/story-20767634-detail/story.html [Accessed 15 February 2015]. Lincs to the past (2012) The Lawn Hospital, Lincoln. [online] Lincoln: Lincs to the Past. Available from http://www.lincstothepast.com/The-Lawn-Hospital–Lincoln/826359.record?pt=S [Accessed 5 February 2015]. My City of Lincoln Story (2014) Lincolnshire Archive by Anya Fitzgerald. [Blog entry] 4 February. Lincoln. Available from http://sitespecific2015ksa.blogs.lincoln.ac.uk/ [Accessed 14 April 2015]. Smith, P (2010) Mythogeography: A Guide to Walking Sideways. England: Triarchy Press. For our site specific module we were given the task to try and make an audio based performance for our audience, and to take the audience members on a ‘journey’ through the use of audio and imagination. We proceeded to call the performance ‘yOURJourney’ which would be performed on May 7th 2015. Using the idea of a drift to see where it would take us, we wandered around Lincoln and ended up around the more industrial area of Lincoln, which made us think of the idea of growing up in Lincoln and how things can change. We stumbled across a dismantled, disused park which we thought may be an interesting site to use and how we could link it well with growing up in Lincoln, as it is a children’s park, as Pearson says: “A large part of the work has to do with researching a place, often an unusual one that is imbued with history or permeated with atmosphere…” (Pearson, 2010) Even though this was an abandoned park, it caught our eye because it had a certain atmosphere about it, just like Pearson states. Thinking about the idea of time and how, in time things can change but we may not notice, we had the idea that, as our park was displeasing to the eye and there was only a slide where there once was a vibrant, children’s park, we thought about how it’s changed over time compared to how it looks now. We wondered if there are any plans in place for this park from the council or is it just going to stay as a disused park. We had some thoughts about incorporating silence into our piece somehow, as when you find out about changes to your surroundings you’re usually not told about it and end up stumbling across it yourself. Our main influence were blast theory, a company which main basis is to tell stories in performances through the use of media production, mostly through audio. There specific audio tour ‘Fixing point’ shows them sending their audience members on a walk through the woods to find a man called Seamus Ruddy, an Irishman who was murdered by the members of the Irish National Liberation Army in Paris, France. This linked well with our ideas of our own performance piece as it was all about taking people on a journey through audio, which blast theory do with a few of their performances. Our piece would be about the changing of time in Lincoln, a 20 minute audio tour/journey to the park and then a 10 minute instalment at the site itself. Taking our audience members on a walk to our agreed upon end point, where they would see us drawing different pictures on the floor of the park with chalk. 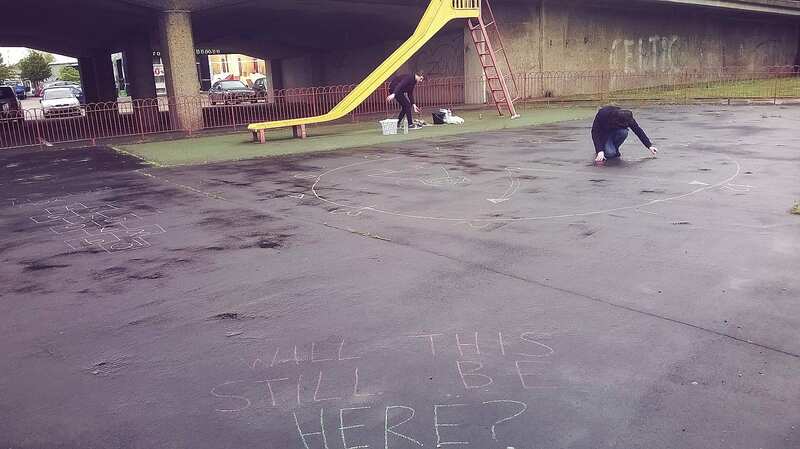 We would then ask them to draw the first thing they think of when they see the dismantled park, on the floor, in children’s chalk – linking to the children who would have once played there. Time is a deconstruction of life, things get built, and things get destroyed for a new generation. Drawing chalk, washing it away. It’s a performance of nature. To start our own personal journeys and to get the process started we had to go on an individual journey and find certain things around Lincoln which interested us. As I was still unsure at this point what sort of performance it would eventually be, I took pictures of the patterns and what I found visually pleasing. As I wandered up towards the cathedral, I found the architectural structure and the engraved patterns really interesting, I originally wanted this visual aesthetic in our performance somehow, but decided it may be too hard. 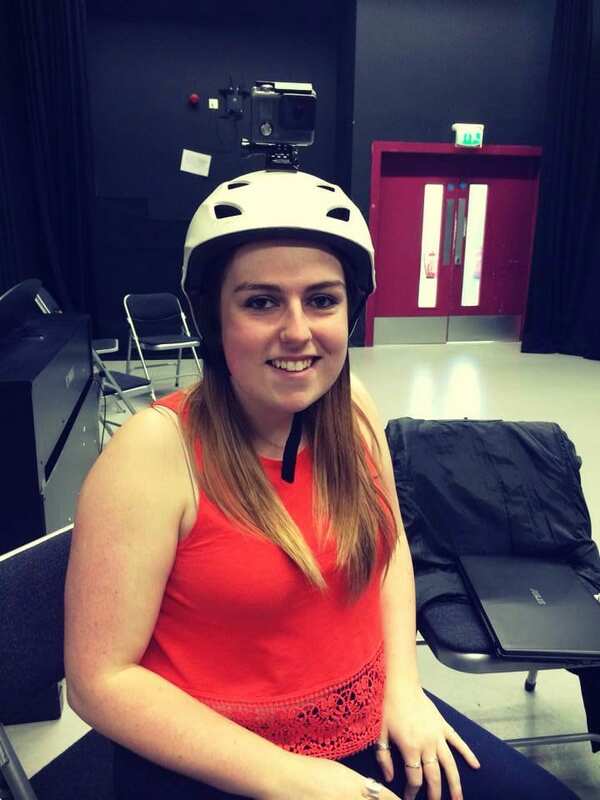 After being put into a group in our lessons, Karen sent us on a drift together so that we could gain some ideas as a group and understand more about what our final performance might be like. “Get rid of rational way-finding! At worst use chance (dice or sticks) to determine which way to go, but best is to go by instinct. If it feels equally good or bad whichever way you turn, then you have come to a ‘plaque tournante’ and your life will be radically different depending on which direction you choose.” (Smith, 2010) As we set off from the LPAC I thought about the mythogeography way of thinking when it comes to drifts and to just walk whichever way feels right. We found ourselves drifting towards the more industrial side of Lincoln, this was visual in many ways, but it wasn’t necessarily visually pleasing. We walked around the old, Victorian houses and the new houses that were built there now, which is an aspect of the change in Lincoln. At first we thought that we could perhaps do some sort of performance about poverty and growing up in Lincoln, as we came across some smashed windows, doors and shoes slung over a telephone wire. As we got further into the drift, we found a dismantled, old, shabby park which looked like it hadn’t been used in a long time. Even though this park was horribly disused, the words of a previous reading came into my head. We suddenly realised that over time this park has changed, as it’s not how it used to be, this is when we realised a performance piece on time and using the park to do an instalment of some sort would be a better idea than poverty. Our next task from Karen was to try and test out the recordings, so that we could get used to using the recorders and get a better idea of what places were ideal to record. We decided to test many different sounds and places, we recorded outside to get more of a raw, ambient sort of sound, but as it was so windy, the audio would just crackle and you wouldn’t be able to hear the audio properly. Taking this into account we tried to cover the microphone with a special microphone cover or, if that was still badly recorded we would try and gather around the mic with our jackets to block out the wind, just to try a few different techniques when recording. Not only our voices but a piano tune too, we played a piano in a quiet room to try and see how well the microphone would pick up the piano, but as it was quite an echoed room we still couldn’t get the right sort of sound we wanted for our audio. Karen also thought it would be a good idea for our group to draw a map of how our audience members could get to the site, so that it could help our development process. Now that we had our finalised idea – time, we all sat down and thought about the different ways we could portray the changing of time in this park. We decided our next step would be to research into Blast Theory and look into the sort of performances they perform including audio. There was one performance that caught my eye, ‘Fixing point’, it was a performance based on audio and having to listen so that you were part of the journey. The next challenge was obviously to edit the pieces of audio that we had previously found. Whilst we were editing the audio we had already found, we thought about the different sound effects and music we could use for our journey. As our journey at this point was mainly based around the children of Lincoln and how it used to be and it is centred on an abandoned children’s park, we started thinking about children laughing, nursery rhymes and certain other sound effects. I decided to ask some people what sort of music/sound effects they would want to hear on a radio play. They said what would keep them interested would be a variety of different sound effects and only a little bit of music as otherwise it would take away from the story line. We definitely took this into consideration for our journey and started to experiment with some sound effects and recordings whilst we were editing. 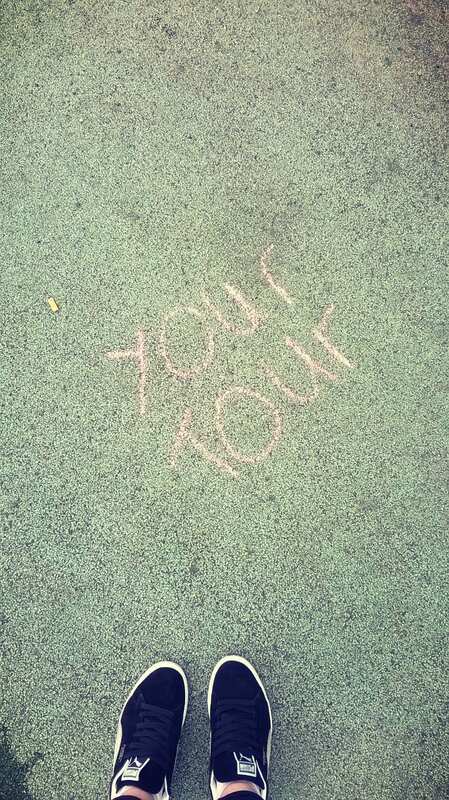 We needed to test our idea of the use of chalk on the parks floor, so that we could see if it was as effective as we had hoped. 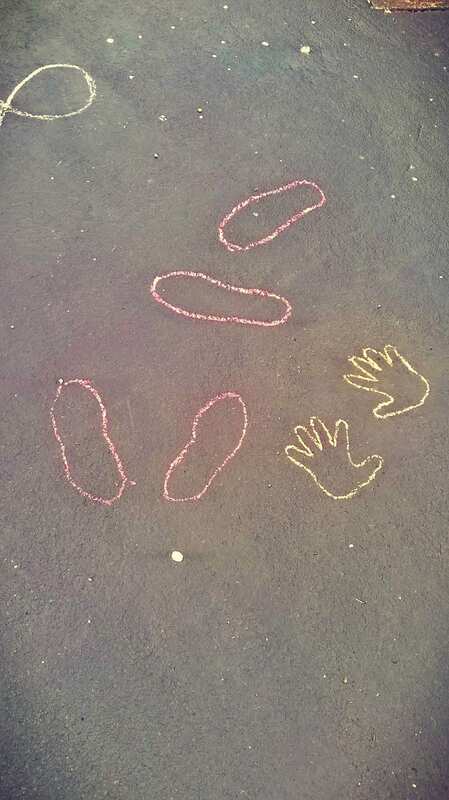 Buying some children’s chalk, we then went to our site and drew all over the floor, anything we could think of that related to our instalment, just to test it and see if it worked. Whilst we were at the site we took a microphone with us, so that we could record some ambient noise as background for our audio. We also tried to use a repetitive action at the site and record that, so that it’s similar to the repetitive actions that we would be doing in our final instalment. Drawing/writing, washing away, drawing and washing away etc. On editing the audio, we collectively decided to write our own script and our feelings and thoughts on the past, present and future of Lincoln so that it would link in with our video of our journey. We all worked as a group and brought together some pieces of writing that we had done in our spare time, so that we could successfully write a long enough script to go together with the 20 minute video that we were currently recording. Whilst we were writing the script we were having several problems with the video footage, and we ended up changing the walk so that it was safer for our audience members. As the weather was torrential on a few occasions, when we would try to record the video it wouldn’t come out probably because of the weather conditions, or some people would get too close to the camera, so we would have to keep re-recording it. We ended up recording the journey 6 or 7 times until we got the final product, which we then continued to edit so it would fit with the audio we had made. The next part of our process was to start recording the audio with all of us, as part of the audio itself. Taking the script that we had all written, we tried to find the best place to record, as some places would have an echoed background to them, we needed a solid and clear recording so that we would have the best quality of audio for our piece. On finding a quiet, enclosed room in one of the buildings of the university we managed to find the perfect sound for our audio. It didn’t have an echo and was clear for our audience members to hear, we each recorded a specific part of the script so that we could all have a part in the audio and worked as a team to ensure the audio was the best it could be at this point. The collaboration of the video and audio together was our next, toughest challenge of the process. We spent hours trying to get the right parts of the audio to fit with the journey of the video, as there were specific parts of the audio that mentioned certain parts of the walk – in the high street for example. We also had to cut parts of the audio together, so they would flow properly. Trying to cut different parts of the audio together and embedding an assortment of the YouTube videos I previously mentioned, we finally managed to get the audio and video sorted after a long night of work. As the main element of our performance was the journey through the visual and audio, we came up with the idea of making our own blog which was separate to the group blog, as originally our idea was to have the video of our journey on the blog and any audience member would have to watch it before the performance date, so we decided to make a visual blog and poster, you can see the video of our journey through this link. (https://yourjourneylincoln.wordpress.com/). Our final rehearsal and the final part of our process was to test our whole instalment at the park, ready for our final performance on May 7th. As our idea was to draw with chalk and wash it away straight after, we felt it would only work if we made sure that it was an effective method for our performance. We took a few buckets, brushes and spray bottles full of water so that we could test the act of washing away the drawings. It was extremely effective, better than we could’ve hoped for. On the day of our performance, it was torrential rain all day, and as our performance was outside we thought this might ruin our instalment, especially as we were drawing chalk on the floor and wanted to wash it off manually, not accidentally by the rain. Luckily, on the morning of our performance we tested the chalk on the wet floor of the park and if anything, the chalk worked better than when the floor of the park was dry, for us, the rain worked in our advantage. Performing to only Karen and Conan on the day we had an idea of giving the audience members a box of chalk each and getting them to write the first thing that came into their heads when they initially saw the park for the first time. They both happily participated and drew a few stickmen playing, an outline of their hands and the words ‘abandon this place’. We decided to perform our piece in complete silence, as if to show the silence of changing in time, when you don’t notice things have changed. They got to the park and we silently held a piece of paper up saying; “Draw what you think of when you first saw this park?” and continued to hand them the chalk over in silence. My role was to slowly wash away a part of the chalk we had drawn in the park and as soon as I had finished a section, I would run off to the hopscotch and do that action to show the repetitiveness of time. For example, the repeating of a ticking clock as time passes. I continued to repeat this action until the performance ended, where we all froze ready for our feedback. Pearson, M. (2010) Site Specific Performance. Basingstoke: Palgrave Macmillan. Smith, P. (2010) A guide to walking sideways. Devon: Triarchy Press. The notion of time can be viewed upon and spoke about in many different ways, whether it be travelling in time, getting lost in time or even keeping time. Throughout our site specific performance we use these different concepts of time to engage and interest the audience as they had a tranquil walk around the Arboretum. In this blog, I will be discussing the ideas, the inspiration and process me and my group had throughout our site specific experience. Our group were not given a specific site, we were given a broad range of choices where we could go, and the only specific theme we had to abide by was to take our audience members on an audio tour using recordings we had created, edited and finalised ourselves. With this information we strolled around Lincoln with the hope something we see or a location we find would give us the motivation and inspiration to begin working on our piece. Eventually we came across the Arboretum, from walking through the entrance and looking at the information board, we began realising how many attractions it had to offer and instantly we all started to propose several different ideas out for each aspect of the Arboretum. When we got into the midst of proposing ideas and thinking of actions that could go with them, we found a quote from a book called “The Timekeeper” by Mitch Albom from which we salvaged a quote about imagining a life where nobody in the world keeps track of the time and we managed to interpret this quote into our audio tour. With this quote, we were aiming to get the audience to think about how little they really think about time, yet everyday it rules what they do and when they do it. Another Influence to our performance came from Punchdrunk’s performance ‘The Borough’, in which they take audience members on individual journeys around a town that the protagonist lived in. We all agreed that the thought of individual journeys could work really nicely through the Arboretum and built on the idea. Although we wanted to utilise different notions of time, we had to realise it was impossible to manipulate the space itself, therefore we could not only use past tense and talk solely about the history of the space as the public area may have ruined the illusion we were trying to create through the audio. At the beginning of the tour, the audience found themselves standing in front of a door, just outside of the Arboretum, which had clearly been out of use for quite some time. We used this door to immediately get the audience thinking about time, the paint on the door was worn, the handle was rusty and the doorbell next to the door was pretty much non-existent. We had decided our characters in previous meetings and had to come up with repetitive actions for each of us to perform that would help the characters we were portraying become clearer to the audience. Our process began with a drift around Lincoln starting from the LPAC and seeing where we ended up. We walked through the high street hoping something or someone would inspire us for an idea or two. We finally found ourselves at the Arboretum; we immediately took notice of the information board and took notes and pictures of the different locations that were in the park. One of the locations which seemed to attract our interest the most was the Cold Bath House, this was because it was explained that it had been bombed during World War Two and there was not much that visibly remained. The history and the story behind the Cold Bath House was what we found most interesting which is why we began proposing ideas to each other with this location as the stimulus of the piece. Researching the history of the Arboretum and the locations inside it showed to be rather enjoyable as we spent a lot of time in the library researching newspaper archives so we could gain further knowledge of the site we had chosen, “A large part of the work has to do with researching a place, often an unusual one that is imbued with history or permeated with atmosphere”. (Gleave, 2010). We certainly felt the location we had chosen was full of historic potential which helped us become sure and cement the site for our performance. One the first ideas we decided to go forward with was that the audience member listening to the audio would follow a young man through the Arboretum as he made his way to leave his family and friends to war. Along the journey, the young man and the listener would meet his girlfriend and his two younger sisters, all of which, he had to say his farewells to, also along the way he would see a warden who would finally lead the young man along his final path before he leaves. Whilst we had this idea, we began to use the sound editing programme Audacity. Using a free sound website we all had a browse through the range of different sounds and spoke about what we thought could work and what was less likely too. The first track we had was compiled of three or four different sounds which would begin at different points in the audio tour. The track was assembled around the sound of quiet footsteps which would play throughout the piece, increasing in pace and volume when we thought appropriate. We believed that whilst the young man was walking through the maze, air sirens could begin to fade in, alerting him of incoming danger, he would then duck down and get the audience to duck as well to get them involved in the performance. Once the man and the audience member reached the centre of the maze, his family would be there to have their final goodbye, during this goodbye we had added gunshots into the audio recording which resembled what one might hear on the battlefield. In the midst of the gunfire, the man was going to get shot and pass away in the arms of his family, the sirens and gunfire would fade away and the warden would appear again to lead the audience member towards the final location of our piece which was the large steps that are central to the arboretum. 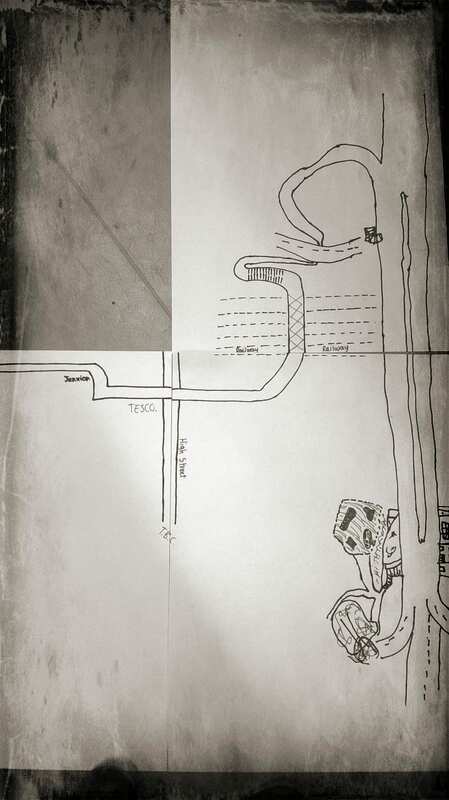 Hayley drew a picture of the large steps as it was another form of documenting our drift. Furthermore, we thought that these steps could be an aesthetic way to end our performance. Mike Pearson makes a point about incorporating the process into our performances. One suggestion is “Describe the location, orientating your listener: Sights, Sounds, Smells.”(Pearson, 2011). From this he gives us the idea of engaging the audience member(s) into our performance using these techniques and how describing these senses can immerse the audience further into our tour. When we showed our tutor the location we had chosen for our performance and also explained the ideas of audio and characters we had come up with, she explained to us that we were thinking to literal about the performance and focusing too much on characters than the site itself. Also she made it a lot clearer that it would be way too difficult to make the performance specific to the time period of the World War because, once again, we would be unable to manipulate the space how we would want it to appear to the audience. After receiving this information, we met as a group and discussed further ideas about how we could alter our performance to make it more specific to the location. As we were talking about the history of the location and how we were trying to incorporate it in to the performance, we began talking about the idea of time and how many different ideas of time people may have. From this and the influence from Punchdrunk’s The Borough we finally agreed that we wanted to take the audience on a journey, not only through the arboretum but through time as well. Hayley found a quote from Mitch Albom’s book The Timekeeper which we decided to use as an incentive and inspiration to create a performance, we recorded Hayley reading the quote and used it to start off the audio tour and we also used it to bring the tour to an end as we thought using the quote twice would make it more memorable and with the hope it would make the audience ponder the notion of time after even after they had left our performance space. This is the quote we used, “Try to imagine a life without timekeeping. You probably can’t. You know the month, the year, the day of the week. There is a clock on your wall or the dashboard of your car. You have a schedule, a calendar, a time for dinner or a movie. Yet all around you, timekeeping is ignored. Birds are not late. A dog does not check its watch. Deer do not fret over passing birthdays. Man alone measures time. Man alone chimes the hour. And, because of this, man alone suffers a paralyzing fear that no other creature endures. A fear of time running out.” (Albom, 2012,). To add to the idea of time, we tried to make sure we could start our audio tours on the hour, the reason for this being, just before the tour started or during the first speech, the Cathedral bells would ring and they could clearly be heard from the starting point of our tour. The first person the audience would meet once the tour had started was me; I was portraying the man who had the Cold Bath House built, Henry Kirk Hebb. Myself and a couple of other group members met in the library to try and find out more about the history of the people we were attempting to give the audience an insight too. After finding a sufficient amount of information about the Cold Bath House, we found out, Henry Hebb had a gardener hired for the house, this man was named George Smith and he was going to be represented through Sarah and her repetitive actions. We believed, because of what had researched, we had good ideas to propose to the rest of the group which could really make our audio tour stronger in the sense of specificity. Once we had explained our research and ideas to the rest of the group we had come to realise it could be difficult to merge both the idea of time in the present and also the history of the location we had previously researched without the result being too confusing. We told our tutor the problem we had encountered and she told us that if we felt we needed to, we could split in to two separate groups and pursue our own ideas. After talking to each other for quite some time, we eventually came to conclusion that we will stick together as a group but we were all open to slightly altering our ideas so it would be easier to fuse the two together. The change that occurred was to try and make both ideas a lot clearer to the audience that the notion of time was an obvious theme to the tour as we wanted to show the past, present and future all in one performance. To help the audience get more of a natural feel to the tour, we had previously recorded backing tracks that were recorded directly from different parts of the Arboretum that the audience would be visiting or walking past such as; birds singing in the trees, the flowing water sound from the various water fountains in the park and the noise of footsteps on the path of gravel inside and around the maze. We believed having these sounds in the audio track would give audience member a feel for the natural essence of the park they were walking through and it also helped very much to ensure we gave the audience something to listen to in between the talking parts of the tour rather than a mere, tedious silence until the next voice is heard. 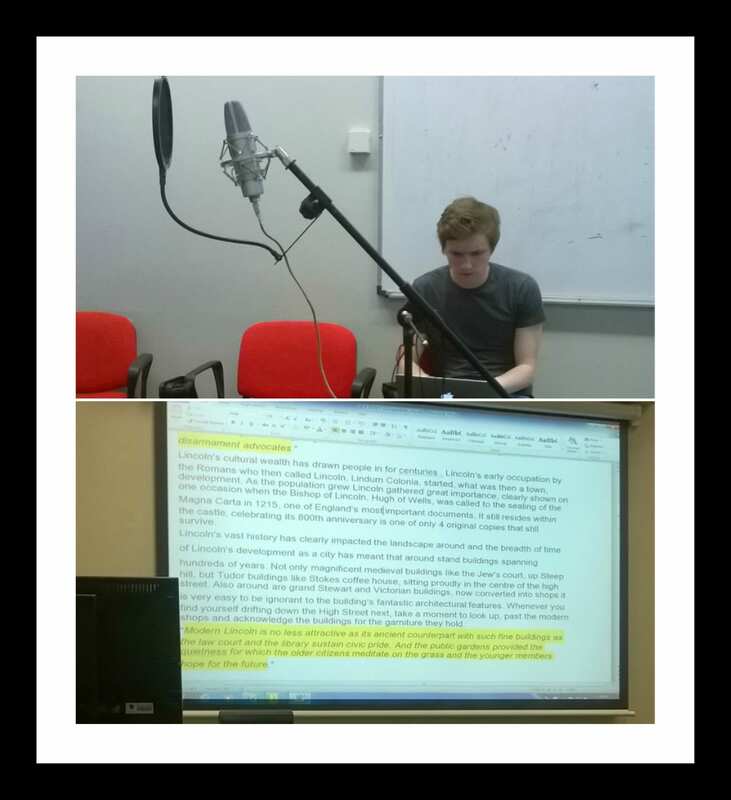 When it came to editing our recordings, we had previous tutorials to help us understand audacity to a level we could comfortably use it without any help, from the first tutorial I had already found myself rather comfortable using the programme so I began offering help to people in my group who may have been finding it more difficult. Me and other members of the group offered to edit the recordings as we felt content with using the editing programme. Once the editing of the backing tracks was finished we decided to go back to our site so we could get a final decision on the route we would be taking the audience on and also so we could attempt to get a helpful timing frame between the start of each voice recording, to ensure a recording didn’t start too early or too late. Our monologues were next on the agenda, we all wrote and recorded our speeches whilst giving help and guidance to each other during the process. We spent a lot of our time editing the speeches in to the audio, having to change volume of different sounds to make sure the audience would never be struggling to hear what we wanted them to. All of the recordings were finished, we knew the time we had between each encounter and the edits of the audio track had finally come to an end, all that was left was rehearsal and then the final performances. For our first main rehearsal, we had Sara wear the headphones and act as our audience member so everyone else could practice making their repetitive actions effective whilst also getting a final idea of timing for the performance. The audience member would start at a raggedy unused door outside the Arboretum, we agreed this was an effective place to start the audio tour as the door represented as a metaphor, a new beginning but also represented, through vision, that the door was damaged and old showing how much time it had been there vacantly waiting for use. Hayley, one of our runners was portraying how people keep time of themselves during activities in the present as her and her jogging partner Sara would be constantly looking at their watches and running at different times with different motions. Hayley greeted the audience member at the door and then began her route of the arboretum leaving the listener to their own devices. The next point in the tour was meeting Henry Hebb under a tree outside the Arboretum gates, represented by me. As the audience listened to my speech which was about the Cold Bath House and how proud Henry would have been to be able to look over Lincoln. At the time of our performance, the Cold Bath House was not visibly in sight, so I had to describe the building whilst also drawing a picture of it as I stood which the audience member was able to see. The play park was the next point of interest as Emma was sat inside; she spoke about her childhood and new beginnings in her speech, with the intention of getting the audience to think back to their childhood and the time that has passed since then. The listener was then told to stand at a ledge just next to the play park and look over the Arboretum and just think about the concept of time, from this ledge they could see Sara and Hayley, the two runners. As I explained earlier, they were involved in the theme of time as they both were timing themselves on their runs. The maze which had George Smith, the gardener, standing inside is where the audio tour led the listener to next. Sarah who was portraying the gardener would be tending to the bushes and grass that was in the maze, in her speech she spoke about the seasons that change the appearance of the Arboretum, we also thought the maze was an appropriate positon to be in because just as you can get lost in a maze, you can also get lost in time, both of these showing the theme of time. From the maze, the listener was then told to walk to the lion statue which is in the centre of the whole park, when they arrived at this location they heard the a speech from Fred Hurt as he told the audience member his accounts of the Arboretum in the past when the park was unfortunate enough to be a victim of the bombings in World War Two. The final recording of the performance was the quote from The Time Keeper we had used at the beginning of the performance so we could try and make the audience member think about time as they would have at the start of the tour. During this final recording, my group and I congregated at the steps opposite the statue and either sat or stood whilst still showing our repetitive actions as we believed it could be a strong ending to our performance. Our performance seemed to run smoothly throughout, there was one point though in which an audience member had to ask a performer where the lion statue was. This was because we had not considered how visible the statue was going to be when trees and bushes had blossomed leaving the statue out of sight. This made us re-evaluate what we could do to make sure other audience members did not have the same problem, if we had encountered the same problem again, we decided Sarah would lead the listener to the statue and then sit on the steps awaiting the final part of the tour. We got told in our feedback that it could have been more of a special moment if the audience member had been invited into the maze and was able to walk around, maybe even gets lost, until Sarah would eventually lead them to the way out. One of the reasons we could not incorporate this idea in to the tour was because of the audio player we were given to use, there was no pause button on the device therefore we could not estimate the amount of time someone may need to get in and out of the maze before starting the next voice recording. This would have been the main point I would have altered if given the opportunity to do the tour again, other than that I enjoyed the process of this performance, having to research different locations gave me a lot better insight to delivering a successful site specific performance. Albom, M. (2012). The Time Keeper. New York: Hyperion. Gleave, J. (2010). THE RECIPROCAL PROCESS OF THE SITE AND THE SUBJECT IN DEVISING SITESPECIFIC PERFORMANCE. 1st ed. [ebook] Birmingham. Available at: http://etheses.bham.ac.uk/3510/2/Gleave_12_MPhil.pdf [Accessed 14 May 2015]. Punchdrunk.com, (2015). Punchdrunk. [online] Available at: http://punchdrunk.com/past-shows [Accessed 15 May 2015].